The Binance cryptocurrency exchange was launched in 2017, and in a relatively short period of time it has gained more than 3,000,000 users. In just 6 months, it became the largest exchange in the world, with a turnover of 3.8 billion dollars. The reason for this was the excellent conditions for trading cryptocurrency, the constant addition of new pairs and more than adequate technical support. The process itself consists of several mandatory and optional steps. We write out all the details below at the end you have not left a single question. We start with the fact that we go to the registration page of the crypto-exchange Binance. On the registration page there are four empty fields, three of which are required. If you do not provide a valid email address, you will not be able to receive a personal account, because it should receive a confirmation email. Fill in the 3 required fields, including «Password» and «Confirm password» (re-entering the password eliminates human error). Next, you need to check the box next to » I have read and agree with the currency Terms of service”, and only then you can click “Register”. Then you will meet the code. As you can see in the screenshot, the security system of Binance asks you to move the puzzle to the right place with the slider at the bottom (left-click and hold the slider itself). 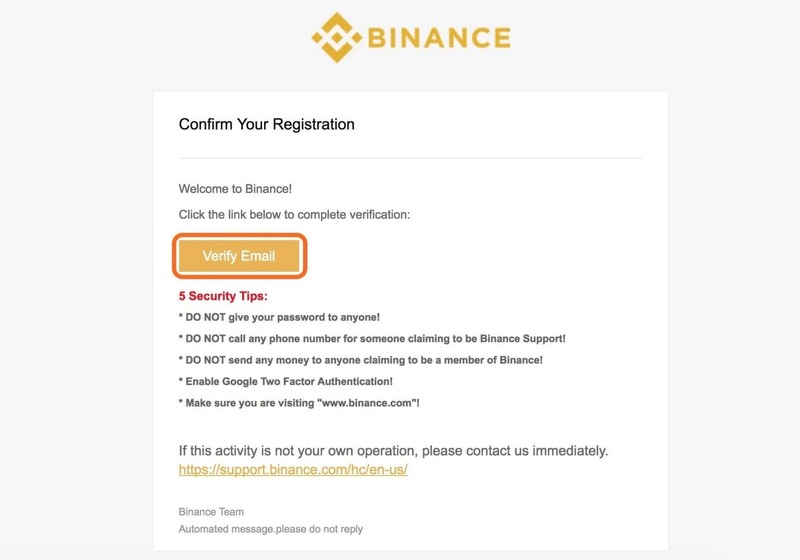 In a moment, a message will appear in the browser that an email with instructions on how to activate your Binance account is waiting for you at the specified e-mail address. All you need to do is open the mailbox, click on the letter from the exchange, and then click the orange button “Verify Email”. Then you will see a message that your Financial account is activated and ready to go. This means that you can log in and start trading in cryptocurrency. If you do not enable a two-factor authorization on the Binance, each authorization will be accompanied by a corresponding reminder. Open her website, click on the «Login» button in the upper right corner and enter your newly registered data (email address and password) and do not forget to click “Login” at the bottom. After that, you need to confirm that you are not a robot: hold the slider under the image with the left mouse button, drag the puzzle to the specified location. If you do it accurately and accurately, you will successfully pass the authorization, and if not, you will have to repeat the procedure. As mentioned above, after authorization, you will be notified that it is recommended to enable additional account protection (2FA). SMS verification is only available to Chinese residents, so the only option is “Google Verification”. Verification using Google is carried out through the mobile application “Google Authenticator”. So install it on your smartphone, whether it is Android or iOS (iPhone). Click on «Google Check» to go to the setting that will take you only a few minutes. 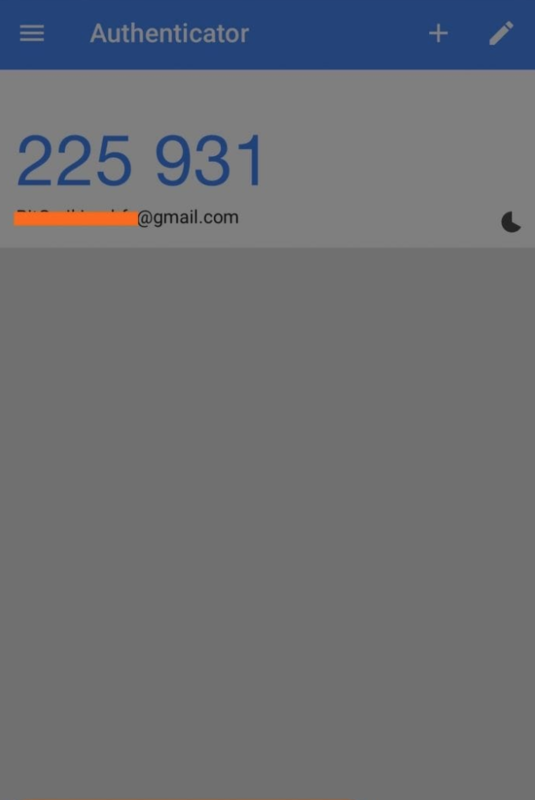 First, install the Google Authenticator app from the link on the left side of the screen. Open this app on your smartphone and press “+” on the top panel to add a new account. 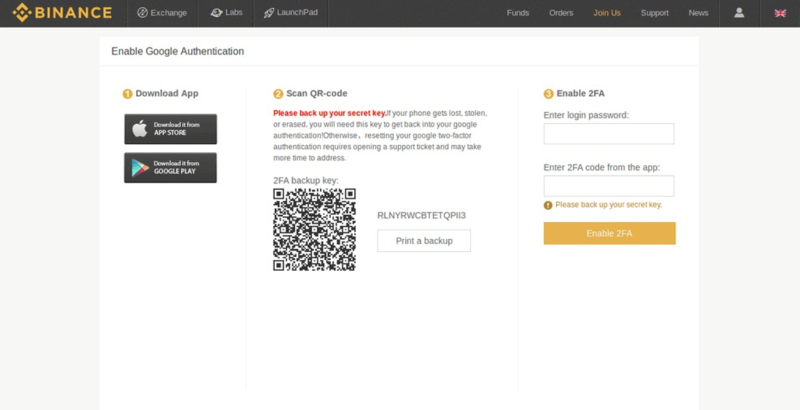 In the leaving menu, select «Scan QR-code», and then point the device camera at the QR-code on the Binance exchange page. Next, you need to click » I’ve backed it up, Continue.” to complete the setup completely. In the window that appears, in the first field, enter the 16-digit key, in the second specify the password from the account, and in the third 2FA-code, which is in the application (the code is generated every 30 seconds). When you are ready, click “Enable 2FA”. If the activation is successful, you will be notified. 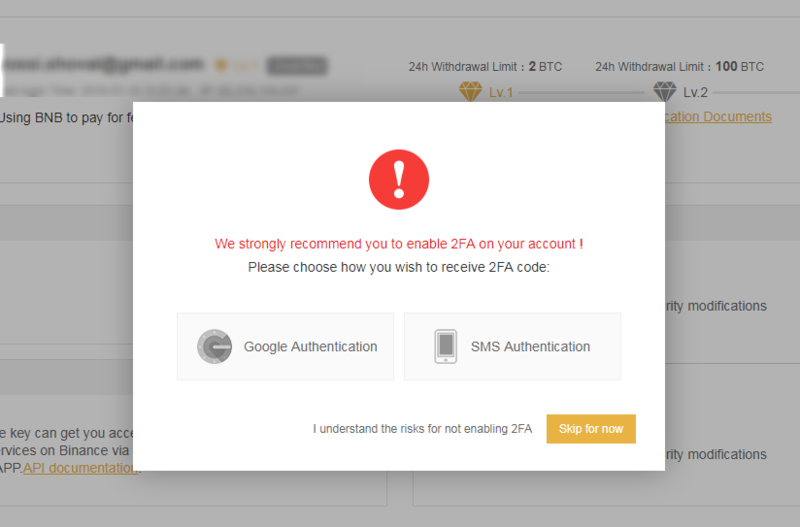 Now, every time you log in to your Binance exchange account, you need to enter the 2FA code from the Google Authenticator app, but the chance of hacking is reduced by a hundred times. The cryptocurrency exchange Binance offers favorable conditions for the withdrawal of funds. There are restrictions of 2 Bitcoin per day, which is more than enough for an ordinary user. If these limits do not suit you, you can pass the verification and increase the limits to 100 BTC per day. Fortunately, the procedure of identity confirmation is simple and does not take much time. For successful verification you will need identity documents. For example, you can use a driver’s license or passport, where the name is duplicated in Latin letters. Confirmation of identity on Binance is an optional step. The procedure must be completed only if you want to remove the restrictions of 2 BTC on Deposit or withdrawal of funds per day. I will verify on the crypto currency exchange Binance, using his driver’s license. Follow my example to successfully complete the verification procedure. Go to Binance.com, hover over your profile icon in the top right corner and click on “user Center” in the drop-down menu. On the next page you will find various profile settings, including verification settings. Next to the email address, your profile level is displayed (I currently have the first level). To the right of it are three available levels of identity verification. The last, third, removes almost all restrictions, but to get it you need to contact the administration of the exchange. Click on «Submit Verification Documents» next to the second level to proceed. You can be verified as a company or an individual. I choose personal verification. You can pass the verification using your passport or driver’s license. In the case of a passport, you need to enter its number, which is located to the right of your photo and is located in an upright position. If you are using a driver’s license, its number is at the bottom of the list on the front side. In my example, the number has the following form: VAN321XXXX (letters before the numbers should be specified using the Latin alphabet). 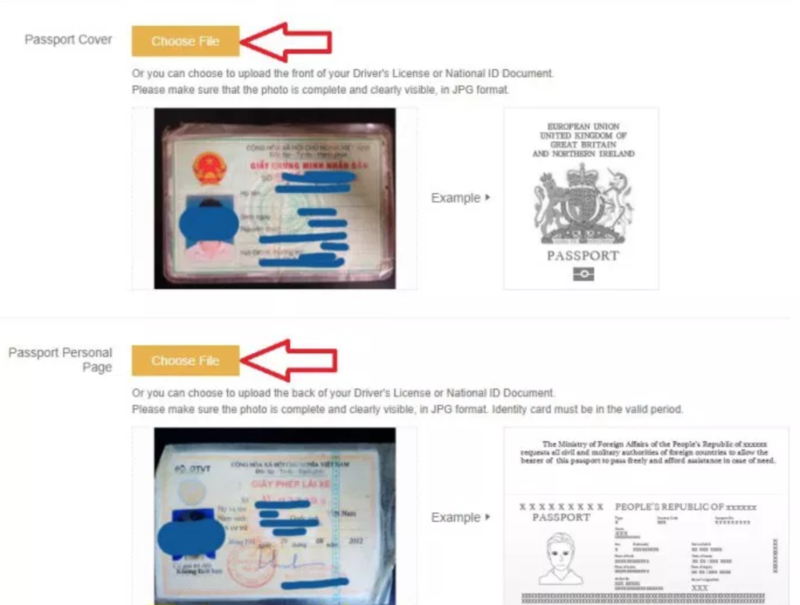 In the event that you have taken your passport to pass the verification, you need to take two photos of the front side and the first page, where personal data should be clearly visible. If you are using a driver’s license, then take a photo of the front and back side so that each letter and symbol are clearly distinguishable. All photos must be taken in JPG format. Many smart phones and cameras offer the option to select a format before shooting. You can also convert the images to JPG later. 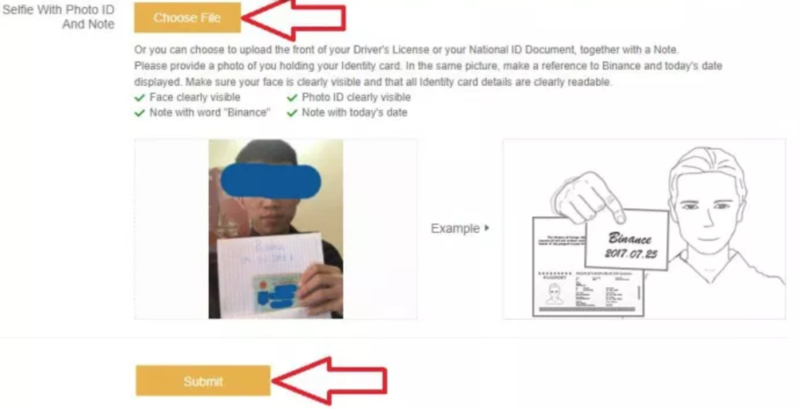 The third photo should contain your documents on the background of the face, as well as the inscription “Binance” with the current date, as in the example. 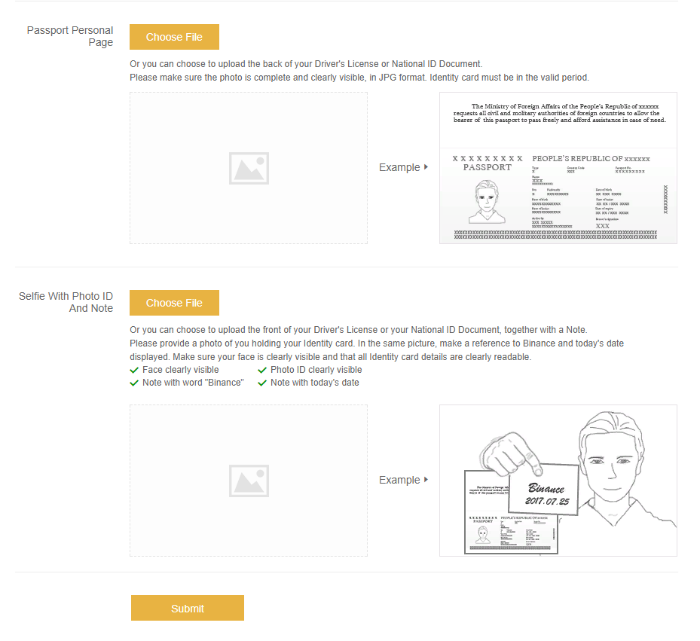 In General, you should have 3 pictures: documents separately on both sides and documents with your selfie and the inscription “Binance” with the current date on a separate sheet. So the administration of crypto-exchange can make sure that the verification is a real person. Upload photos to the relevant sections and check the form if you have completed everything correctly and without errors. When you’re ready, click the Submit button at the bottom of the page. Now you have to wait for a response from the exchange. On average, the verification process on the Binance takes from 15 minutes to 2 hours, so be patient. You’re done, your account is now verified!